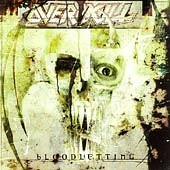 I have got to put OVERKILL in the same category as bands like MOTORHEAD, AC/DC, and UNLEASHED. Not because they sound anything like those bands but because they are so consistently solid that is blows my mind. The music world is constantly transforming and evolving, as it should, but it is nice to know there are a few bands out there that can tell the difference between the winds of change and the breeze of fads. OVERKILL has managed to keep themselves relevant and cutting edge without sacrificing their core sound one iota. They haven't forsaken what they are in some ill advised and transparent attempt to cash in on the flavor or the day as so many (if not most) long running bands do. You always know that when you buy an OVERKILL album you are going to get first rate thrash metal with razor sharp riffing, clear yet demented vocals and throbbing feel-it-in-your-chest rhythms. "Bloodletting" is dead on. It is classic OVERKILL with all the nuances, touches, shades and flavors that have come to define the band in their 15 plus year history.